Well, I must apologize for the lapse in posting, but my wife had our third baby in May and I checked out for a while getting situated at home with 3 kids! Luckily life is good and I’m back to fishing and feeding the addiction! The tug really is the drug! As many of you may know, our mountain is burning with the largest wildfire in the U.S.A. The fire, named the Brain Head fire, started when a homeowner up near Brian Head Ski Resort was burning some weeds and it got out of control. The fire spread fast and quickly got out of hand. As of today, the fire has spread more than 80 miles and has burned 54,000+ acres and is only 10% contained. The road up to Brian Head and over to Panguitch (Hwy. 143) is closed, as well as a few periphery roads in the area. Please send good karma, mojo, thoughts, and prayers this way! This fire is affecting many watersheds and a couple of our favorite fishing spots, namely Panguitch Lake and Panguitch Creek. We hope everything turns out okay, as this fire is going to affect a lot of people and their livelihoods. And hopefully the fish make it through! I’m anxious to see the consequences from this fire in the coming months and years. For updated fire information click this link https://inciweb.nwcg.gov/incident/5253/. Avoiding the fire has meant we’ve been fishing other places, but luckily southern Utah is so vast that we have many other areas to fish. 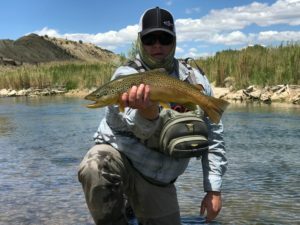 Dry fly season is upon us and we’ve been fishing this past week and it’s been phenomenal! We have multiple hatches coming off the rivers each day and the fish are gorging themselves and getting big! The average size brown trout we’ve been catching on dry flies is 16 inches and 1.5 – 2 pounds, and once they decide to run in the current, hold on for a wild ride! We’ve hooked a couple fish over 20 inches, and a few in the 17 – 19 inch range. These wild fish are feisty and strong and our arms ache from catching so many of them! Call us and get up here to catch some because it’s been crazy good right now and it won’t last long! Check out this short video clip of some rising fish we found during one of the hatches! Watch at full screen with the volume turned up so you can hear the splashing and slurping fish. You can tell they’re big!